MAN will be presenting a strong future-proof portfolio of trucks at the IAA Commercial Vehicles fair in Hanover, the leading trade fair for mobility, transportation and logistics which takes place from September 22 to September 29, 2016. 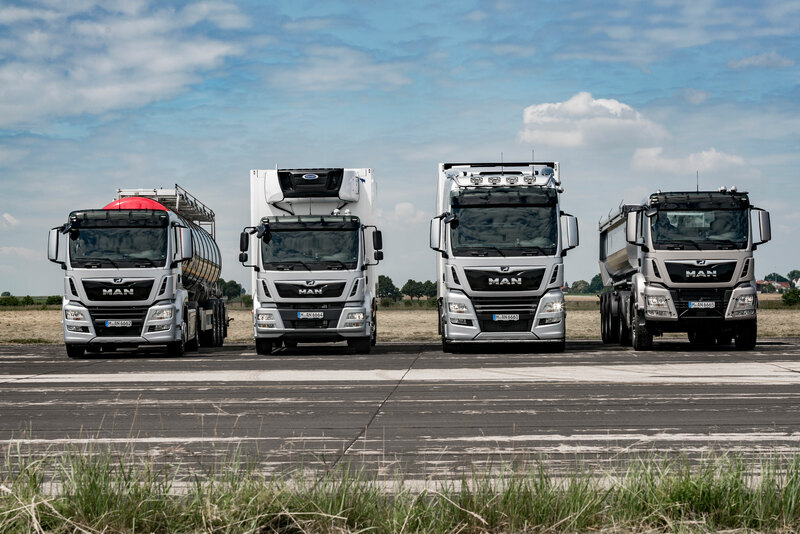 For the 2017 range, MAN is taking numerous steps to optimise its engine programme to ensure significantly improved fuel consumption with increased performance and driving dynamics as well as the expected high level of reliability. In combination with the new versions of the MAN TipMatic transmission, the MAN ranges provide highly efficient, economical and environmentally-friendly drivetrains. This is accompanied by a strong brand identity. Exterior and interior design innovations in the TG range strongly place the trademark of the lion in the foreground. MAN will be unveiling numerous design innovations for its TG series at the IAA 2016. Externally, the MAN lion, the emotional figurehead of the brand identity, stands proudly in the foreground. The chrome lion positioned on the chrome trim above the radiator grille is significantly more prominent against the new high gloss black background. On the inside, warm colours with new materials and seat upholstery lend all TG models a bright and high quality feel. Furthermore, the driver’s workplace benefits from a new infotainment system, automatic headlight activation and rain sensors. For the TGX and TGS series, MAN is also introducing a reworked front design at the IAA. Aerodynamically optimized radiator fins give the front a compact and unified appearance. The new fin elements with their upward angled blade profile improve the air flow to the radiator located behind and increase the cooling efficiency. Within the scope of the reworking process, the wide cabs of the TGX are equipped with two horizontal fins. These can optionally be enhanced with a adorning chrome trim. The narrower cabs of the TGS are fitted with a horizontal radiator fin, giving it a strong and robust appearance. As a result of the reworking of the exterior and interior design, all TG series models are equipped with new standard steering wheels. These now have the same geometrical shape as the comfort steering wheels. Recessed grips provide outstanding ease of use for the principal task of driving. The standard steering wheel material is PUR (polyurethane). The comfort steering wheels are also available in an elegant leather design. MAN is introducing numerous driveline innovations in its new TipMatic generation at the IAA 2016, designed to reduce fuel consumption and increase driving comfort. In combination with the new versions of the MAN TipMatic transmission with individually coordinated driving programmes for every area of application, the MAN ranges provide highly efficient, economical and environmentally-friendly drivetrains. MAN has optimised the automated TipMatic gearbox in their vehicles with individual moving-off and switching strategies for each specific area of application and added various new functions to enhance efficiency and comfort. The switching dynamics of the new MAN TipMatic are designed in such a way that gear changes can be made as fast as possible. The new SmartShifting function combines a rapid switching process in all gears to suit every driving situation. Taking the accelerator pedal position, vehicle mass and the calculated driving resistance into consideration, the gearbox software determines the optimum switching speed for every situation. From mid-2016, new infotainment systems with larger displays and refined sound will be available in the MAN TGX, TGS, TGM, TGL and TGS WorldWide. The top-of-the-range model is the MAN Multimedia Truck (MMT) Advanced, boasting a 7-inch display, DAB+ (digital radio reception), convenient telephony and enhanced, truck-specific navigation. The new infotainment offers possibilities like wireless streaming function, Bluetooth connectivity, additional memory cards in addition to a high-quality audio experience. The MMT's enhanced Bluetooth functionality also allows two telephones to be connected to the MMT simultaneously, for example a business and a personal phone. The centrally positioned MMT Advanced therefore offers not just the best sound and radio quality for entertainment, but is a specialised truck navigation unit which guides driver and truck securely and efficiently to their destination. The MMT Advanced also has two inputs for external cameras. These can be displayed manually or can be programmed to display automatically when using specific functions. For example, the images from the reversing camera can automatically be displayed on the monitor when the truck is in reverse, or the driver can manually switch to an available cargo hold camera.